La Rioja oil provides to the kitchen a touch of quality and distinction. Its delicious flavor customizes each dish offering multiple culinary uses. Raw or fried, is used in every meal as one of the main pillars of nourishment. For breakfast, it is delicious spread on toast. Exquisite and healthy, the extra virgin olive oil is the only vegetable oil that can be eaten raw, inviting consumers to enjoy its extraordinary aromas and flavors. As a snack before meals, it is an original proposal served in a bowl with bread spreads. The oil creates a protective layer in the stomach that contributes to better digestion, especially in the case of large meals. Its sensory qualities make the olive oil from La Rioja an ideal foodstuff for the dressing of many dishes and salads, providing a great personality to recipes with raw vegetables, fish and meat, cooked in different ways. 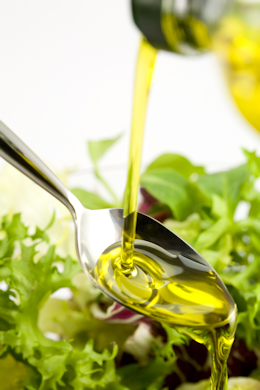 With fried food, extra virgin olive oil offers more advantages than other vegetable oils. Having a higher boiling temperature, it creates a protective layer around the food that prevents it from soaking and retains its juices. Oil consumption and calorie intake are lower.